Logic Engineering's "Everything from one hand" approach ensures a correct implementation of the manufacturing design and the fast set up of the manufacturing facility. ​Based on the product design an effective and efficient manufacturing process is created. Hereby an optimal level of integration and an optimal depth of manufacturing is defined. Based on the manufacturing process the necessary open and closed manufacturing space is determined, the production layout is prepared and the necessary equipment and machines are identified. Further the necessary number and the skills of the Human Resources are determined. With its wide network Logic Engineering is capable to source and supply the necessary machines and other equipment for the manufacturing process. through well trained human resources. To ensure a successful serial production the necessary know-how transfer is done through intensive training by Logic Engineering. ​By conducting a properly Initial manufacturing phase Logic Engineering sets the stage for a successful product launch. During this phase pre-manufacturing lots are created using the actual Processes so that all components are made exactly as planned for actual production. Production tooling are accepted, through meticulous tests. Inspection procedures, processes and assembly instructions are used, verified and modified as required. 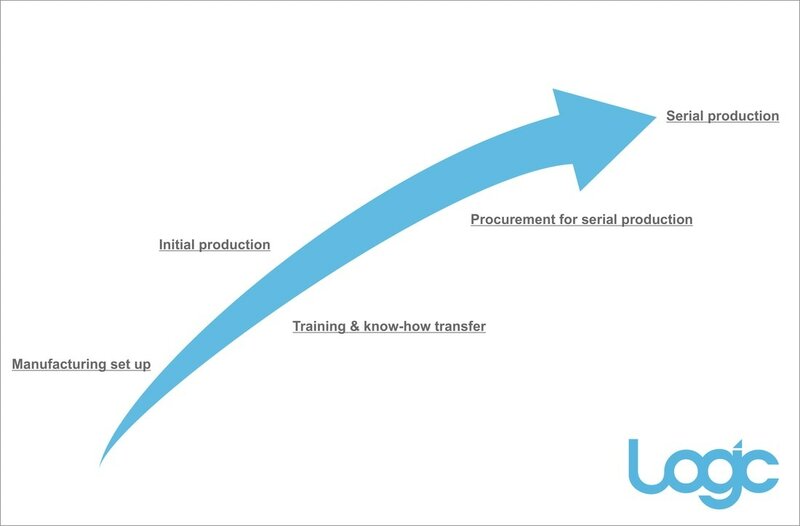 ​At the point where the product is ready to go out to the world, it is ready for production. For many products this is where the real work begins. With its wast network of suppliers Logic Engineering relieves much of that stress by delivering all necessary input materialfor the production to ensure a delivery of the right good, to the right time, at a right amount for the best price.